For the last year, as many of you know, I have been living without net at my new home, which means I have been having to commute to a friends to get any SL related work done. For someone who doesn’t work anymore, due to health issues, this has been hard to deal with since there are some days I just can’t make it in to town to blog. Along the way I have had to leave stores I loved as a blogger because I just couldn’t live up to the expectations and requirements, and now, once again I am faced with the same decision, leaving stores so I don’t let them down. People have come to expect certain things from me as a blogger, and I no longer feel like I can do that for everyone, so I am cutting my sponsors down to a manageable number with realistic expectations for me at the moment. Maybe some day in the near future I will be able to blog again from the comfort of my own home where I can rest if needed, or get up and clean things at home (which has SERIOUSLY been suffering) and work at the pace that keeps me healthy and productive. I know some people may not understand how much of a big deal this is for me, but the idea that people are counting on me to help promote their creations is HUGE. I hate letting people down, especially when it comes to business, as well as it isn’t fair to the store or all the other bloggers out there looking for their chance to be seen, and I know how important that can be. So I bid a fond farewell to those I can no longer blog for and send out a big universal thank you for letting me showcase your creations! Since the stress lately has been overwhelming, I have found myself escaping to our tub for long stretches at a time. The world just seems to slide away and I am reminded of the Calgon commercials from the 80’s as I literally just get swept away by the gentle sounds of the water lulling me into a state of relaxation. Lucky for me I don’t just get to have that feeling at home, with this amazing new release from Heart Homes I can now slide into the tub in my virtual life and let the stress of the day wash right off of me. 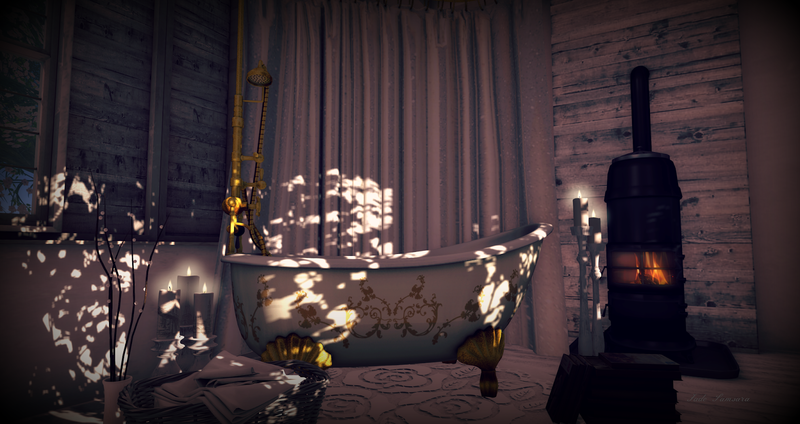 So if you are looking for the perfect bathroom decoration or if you happen to be lacking a tub you can relax into in real life then head on over to Heart Homes and Aphrodite and get your hands on this incredibly well made antique claw foot tub, trust me, you will not be disappointed! Next Post I’m gonna show you crazy! – Featuring Tameless, Glam Affair, IT!